Saunas as a therapeutic modality for restoring health have been used for centuries. The earliest saunas were holes built in the side of a mountainside in which hot stones were placed and water poured over them. The concept of sauna use was brought to North America from Finland in 1638. The Finnish people used saunas for childbirth, rejuvenation, and restoration of health. Most people are familiar with traditional steam saunas. These operate at very high temperatures, in excess of 200°F, and lead to high levels of humidity. Traditional saunas heat from the outside in, thus it does not penetrate deep into the body. These saunas can be uncomfortably hot for people, and only 2-4% of toxins trapped in the body are released when you sweat. In 1893, Dr. John Harvey Kellogg introduced the electric light bath at the World’s Fair in Chicago. The light that he used radiated energy in the far infrared range. Dr. Kellogg’s electric light bath was utilized by physicians to treat the King of England who had issues with gout. Many years later in the 1960’s NASA began studying how to produce far infrared rays with their technology. In 1965, a Japanese doctor created the first ceramic infrared heater. This infrared technology was brought to the United States in the 1980’s. Since then, infrared heat technology has been refined to produce the most therapeutic experience for those seeking infrared sauna therapy. Infrared light, which humans experience as heat, is the invisible part of the sun’s spectrum. Although we cannot see it, we can feel its warmth. The heat generated from the palms of our hands is far infrared heat. The warmth felt coming off of a rock that has been in the sun is infrared heat. Premature babies are kept warm in incubators that utilize infrared heat. Infrared light waves can alter cells, DNA, cell membranes, and cellular fluids. Far infrared light waves are too long to be perceived by the eyes, so they will not damage eye tissue. Nor will they cause a burning effect to the skin. A 2012 study published by doctors at Massachusetts General Hospital in Boston concluded that devices that deliver far infrared light are safe, effective, and can be used to treat a variety of medical disorders. A far infrared sauna differs from traditional steam saunas in that it heats from the “inside out.” Far infrared saunas use a special heater called an infrared radiant heater to generate infrared light waves. These infrared light waves heat the person but not the air around the person. They penetrate deep into the skin and between 2 to 3 inches into the body, unlike traditional saunas. The infrared light energy is turned into heat in the person’s body, which increases the body’s core temperature. This rise in temperature enables a person to effectively rid the body of toxins and pollutants at the cellular and molecular level. The temperature inside of an infrared sauna is around 30 degrees cooler than a traditional sauna, which makes for a much more comfortable atmosphere. Research for the past 30 years has shown that the use of infrared sauna therapy has proven effective for over 100 health conditions. Due to a parasympathetic healing effect on the body, positive effects for vasodilation, anti-aging, stress, anxiety, detoxification, pain reduction, and cardiovascular health have been shown. In a 2002 study by the New Jersey Medical School At UMDNJ, it was concluded that heat therapy was more effective in decreasing low back pain than the use of oral analgesics. Other studies on infrared saunas have shown they are also effective for lowering blood pressure, weight loss, skin purification, fibromyalgia, joint pain, depression, immunity, and increasing metabolism. 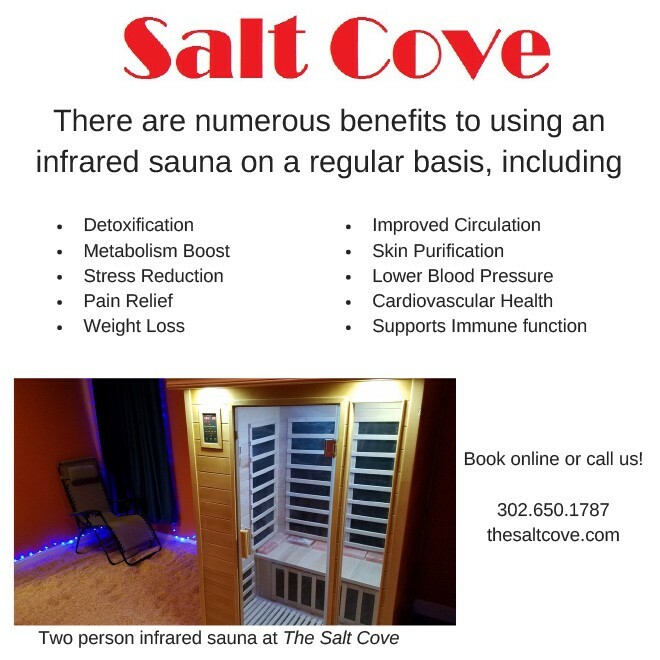 At The Salt Cove, our infrared sauna can fit up to two people at a time. It features an LED lighting system, large carbon fiber panels for optimal heat, and shielding from EMF. An initial therapeutic treatment is 15 minutes at 115 degrees until the body adjusts to the heat. 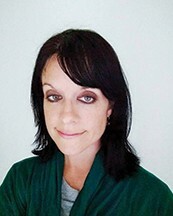 Consult with your doctor if unsure to begin infrared sauna therapy.